Some journals are thinking of discouraging authors from reporting p-values and encouraging or even requiring them to report confidence intervals instead. 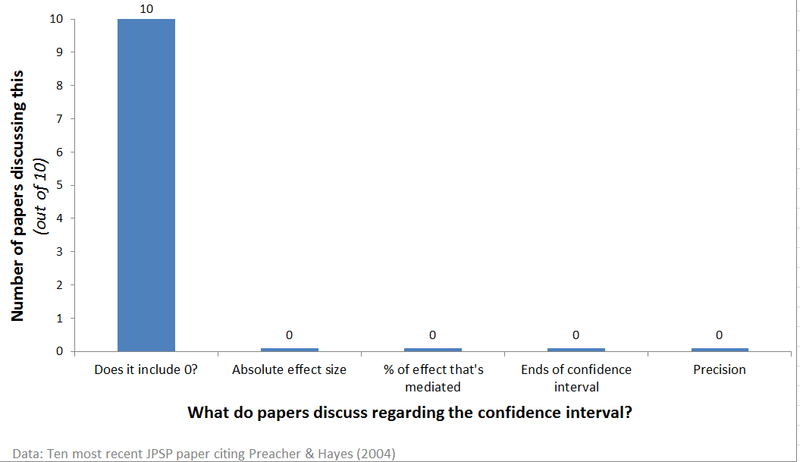 Would our inferences be better, or even just different, if we reported confidence intervals instead of p-values? One possibility is that researchers become less obsessed with the arbitrary significant/not-significant dichotomy. We start paying more attention to effect size. We start paying attention to precision. A step in the right direction. Another possibility is that researchers forced to report confidence intervals will use them as if they were p-values and will only ask “Does the confidence interval include 0?” In this world confidence intervals are worse than p-values, because p=.012, p=.0002, p=.049 all become p<.05. Our analyses become more dichotomous. A step in the wrong direction. To empirically assess the consequences of forcing researchers to replace p-values with confidence intervals we could randomly impose the requirement on some authors and see what happens. That’s hard to pull off for a blog post. Instead, I exploit a quirk in how “mediation analysis” is now reported in psychology. In particular, the statistical program everyone uses to run mediation reports confidence intervals rather than p-values. How are researchers analyzing those confidence intervals? I went to Web-of-Science and found the ten most recent JPSP articles (.html) citing the Preacher and Hayes (2004) article that provided the statistical programs that everyone runs (.pdf). All ten of them used confidence intervals as dichotomus p-values, none discussed effect size or precision. None discussed the percentage of the effect that was mediated. One even accepted the null of no mediation because the confidence interval included 0 (it also included large effects). This sample suggests confidence intervals do not change how we think of data. Unlike other effect-size estimates in the lab, effect-size in mediation is intrinsically valuable. If we want researchers to care about effect size and precision, then we have to persuade researchers that effect size and precision are important. My talk at a recent conference (SESP) focused on how research questions should shape the statistical tools we choose to run and report. Here are the slides. (.pptx). This post is an extension of Slide #21.